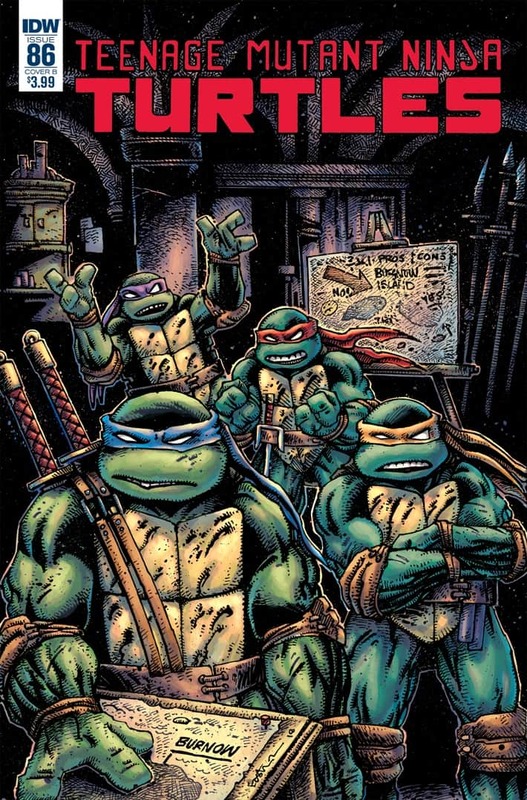 Home » Comics News » As Seen At SDCC 2018 – Teenage Mutant Ninja Turtles For All! As Seen At SDCC 2018 – Teenage Mutant Ninja Turtles For All! Written by: KristaG on July 27, 2018. It’s been over 30 years since the Teenage Mutant Ninja Turtles (or TMNT for short) made their original debut on May 5th of 1984, and yet the franchise has never really waned in popularity. There have been various story arcs spanning not only numerous comic books, but also comic book publishers as well as several television shows, movies, video games, role-playing games, concert tours, and even board games! Personally, as many of my regular readers know, I have been a TMNT fan for much of my life so when I learned that there were going to be several TMNT panels held throughout the weekend at San Diego Comic Con 2018, I knew I had to get to as many of them as I possibly could! The first one, held on Thursday, July 19th, featured Kevin Eastman (one of the original creators of the franchise), Tom Waltz (writer for IDW’s TMNT), Bobby Curnow (editor for IDW’s TMNT), and Mateus Santolouco (artist for IDW’s TMNT) and covered the past, present, and hints at the future of the franchise as a whole. As someone who has more or less had a lot of her life shaped by growing up with TMNT, the discussion on the history of the franchise brought up a lot of great memories and gave me some really cool insight into Kevin Eastman and Peter Laird’s world. For example, IDW Publishing will be reprinting Kevin Eastman and Simon Bisley’s Bodycount, which was originally published in 1995. 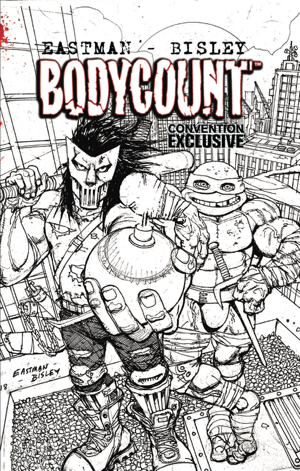 Bodycount is, in Eastman’s own words, “[the] most violent and insane” of his TMNT works and is a narrative that focuses on Raphael (a.k.a. Raph) and Casey Jones. The reprint will be available in August from IDW, but there was also a white cover “Con Exclusive” edition available at the IDW booth. It was also revealed that Casey and Raph are Eastman’s favorite pairing (they are my favorite as well), so it wasn’t too surprising that Eastman has paired them up for numerous adventures and story arcs. As he put it, “Casey is the ‘go to’ when taking Raph to weirder and darker places.” It was also stated that “if Raph met someone crazier than him, he might look inward a little bit,” which I found to be an insightful new perspective when it comes to my favorite of the four terrapin brothers. The “Present” of the TMNT franchise includes IDW Publishing’s Teenage Mutant Ninja Turtles, Teenage Mutant Ninja Turtles Universe, and newcomer Rise of the Teenage Mutant Ninja Turtles! IDW Publishing has had the TMNT license for about 7 years now. Their first TMNT comic (Teenage Mutant Ninja Turtles #1) was released on August 24, 2011, with the story by Tom Waltz and illustrations by Dan Duncan and Sam Keith along with Kevin Eastman pulling double duty as a writer and illustrator. As of today’s date, IDW is now on TMNT issue #84 with #85 slated to be released on August 8, 2018. IDW Publishing tends to run their TMNT comics as “mega stories” of 50-issue arcs, which means they are currently in their second arc for this particular series. During the panel, it was revealed that issue #86 will be introducing a new story-line (“Battle Lines”), which will help to set up the conflict to come as well as aid in beginning to wrap things up with the push to issue #100. Tom Waltz disclosed that there are “big things and big surprises” that must be met by issue #100 and that the stories do need to stay true to the turtles themselves whereas Eastman stated that issues #90-100 are “so, so, so intense.” One such surprise that was hinted at will be the reveal of some of the allies and reinforcements that will be making their appearance in the upcoming battle against Agent Bishop on Burnow Island. In addition to the Teenage Mutant Ninja Turtles series of comics, IDW also publishes several other series that focus on the same characters. One such series is Teenage Mutant Ninja Turtles Universe, which is written mainly by Paul Allor and illustrated by Damian Couceiro. Currently, TMNT Universe is on issue #24 and, Tom Waltz explained, is a series he tends to read as a fan. Another series, which released issue #0 the day before the start of the convention, is Rise of the Teenage Mutant Ninja Turtles. This comic, written by Matthew K. Manning, goes along with the new show from Nickelodeon of the same name (there was a separate panel held later in the day about the show). 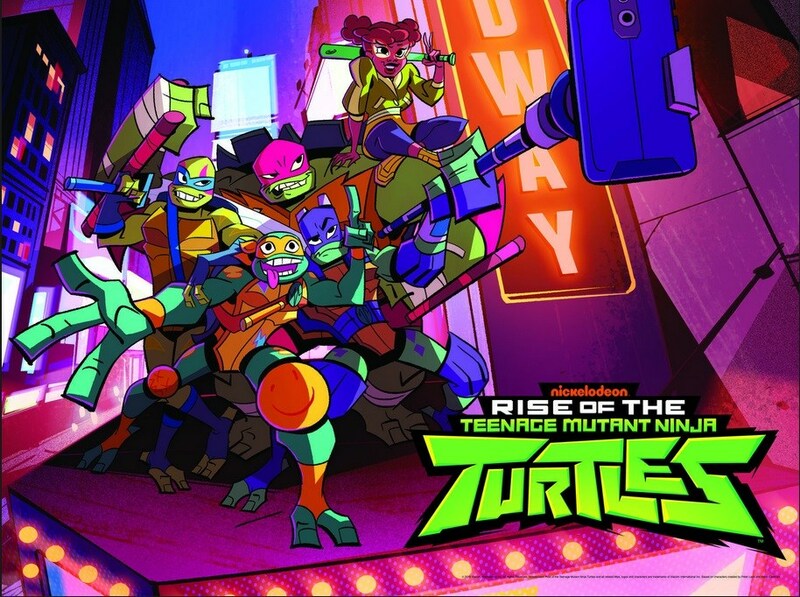 Rise of the Teenage Mutant Ninja Turtles is the new animated series on Nickelodeon! When it comes to the future of the franchise, obviously both the comic and the show Rise of the Teenage Mutant Ninja Turtles will come into play. For those that have long followed any of the previous animated series, this new foray into the lives of the Turtles and their allies might bring some shock value. There is a whole new animation style, some mixing up of the traditional dynamics that the brothers have held (for example, Raphael fills the role of leader over Leonardo), new villains (such as Man Bun, the “hipster villain rabbit”), and a very different cast of voice actors. Though I hadn’t watched the show much at all prior to the panel, I had seen the teaser trailer and have since watched the first three episodes. My personal opinion about the show as a long time fan is…pretty mixed. I do like that the Turtles do behave more like undisciplined teenage boys and play around with each other more as brothers tend to do and I think the animation style is starting to grow on me. Some of the voice acting, though, I’m not so sure about, nor do I like how Splinter is currently being portrayed. However, I am taking the advice of Tom Waltz and “[giving] it a chance” in the hopes that it actually is “going to be to be a really good show” and that it might be something to peak the interests of newcomers to the franchise. With endorsements from both Tom Waltz and Kevin Eastman during the panel, I feel I should at least try to get through the first season. I want to make sure I reiterate that the future of the TMNT franchise does not lie solely on Rise of the Teenage Mutant Ninja Turtles. In fact, it is very far from it. There are quite a few new things planned for the comic book world in the upcoming months and, hopefully, for years to come. Along with the previously mentioned push to issue #100 in TMNT, Bebop and Rocksteady will be making a reappearance in an all-new 5-week mini-series event: Bebop and Rocksteady Hit the Road. The mini-series will be hitting the shelves in August 2018 and will center on the two mutants as they travel with Anchovy on a road trip back to New York. Including story and illustrations from Ben Bates and Dustin Weaver, this mini-series has been described as the “funniest and craziest” and will also introduce several new characters to the franchise. To go along with the new mini-series, IDW Publishing will also be releasing a new macro-series later in the fall. Macro-Series #1 will center on Donatello (and be titled after the Turtle, as well), followed by Michelangelo, Leonardo, and Raphael. Each issue of the macro-series will have a different author and illustrator(s). Macro-Series #1 Donatello, for example, is written by Paul Allor and illustrated by Brahm Revel. Donatello will also include the return of Metalhead (one of my favorite characters ever!). Ian Flynn and Michael Dialynas will be working on Michelangelo, which will include more of the story-line where Master Splinter is the leader of the Foot Clan. Sophie Campbell will be both writing and drawing Leonardo. I am actually rather excited about this one as I love her art style and feel she is the perfect choice for Leonardo as she creates beautiful Feudal Japan inspired works, which always make me think of the blue bandanna-wearing turtle. Kevin Eastman himself will be returning to work on Raphael, which has been described as having a “wrenching story” by Bobby Curnow. Also disclosed during the panel was the announcement of Shredder in Hell, which will be both drawn and written by Mateus Santolouco and released in January 2019. It has been teased that there will be some heavy character exploration when it comes to Shredder – including some of his deeper motivations! The upcoming comic was described as being “philosophy mixed with adventure and killing monsters.” With regards to what those in the panel would like to try to do with the future of the franchise, there were a few ideas that were tossed around. One such idea included a crossover with Daredevil since things seem to work out well with the TMNT/Batman and TMNT/Ghostbusters crossovers. There was also talk of adding to the TMNT/Ghostbusters crossover series if at all possible. My personal favorite of the ideas is an animated series that features the IDW Turtles and their story-line. One thing, however, is for sure: there will be a “return to roots” at some point for the Turtles and they will return to the streets of New York City as the heroes we earlier fans know them for, which excites me greatly! The “Future” of the TMNT comic book franchise includes Shredder in Hell, Bebop and Rocksteady Hit the Road, and a new macro-series including Macro-Series #4: Raphael.